This page provides access to feedback and metrics about the UK Web Focus blog. On 19 May 2014 the UK Web Focus blog was listed at number 25 in the eBuzzing ranking for technology blogs. This was the highest ever ranking for the UK Web Focus blog. In addition on the same date the blog was listed at number 836 of all blogs monitored by the eBuzzing service. During 2012 86 posts were published. There were a total of 66,769 views over the year. This was the equivalent of an average of 183 daily views. A summary of blog usage in 2013 was provided by WordPress.com. In January 2013 the eBuzzing service gave the UK Web Focus blog a ranking of 33 in its Technology category. As can be seen, this is the highest ranking in the past 2 years. Note that the UK Web Focus blog also have a general ranking of 779 which, again, is the highest ranking in the past 2 years. During 2012 160 posts were published. There were a total of 90,149 views over the year, the highest ever. This was the equivalent of an average of 246 daily views. A summary of blog usage in 2012 was provided by WordPress.com. On Friday 16 November 2012 the UK Web Focus blog was included in the Guardian Higher Education Network’s list of technology blogs which covers blogs with useful resources on technology, including digital media, narratives and public engagement. The posts on What’s next, as Facebook use in UK universities continues to grow? and Can LinkedIn and Academia.edu enhance access to open repositories? have been republished on the LSE Impact of Social Sciences blog. On 22 August 2012 the post on “Celebrating 10,000 Followers!”: Social Media is About Nodes and Connections was featured in the Technorati’s top 5 list of Small business blog posts. Brian provides advisory services, blogging about web innovation and tech best practices. He is based at www.ukoln.ac.uk, University of Bath, UK. His site has a range of different resources and white papers on key technical topics, such as social media use and networks, web accessibility and the future and horizon of technology. All of these topics are discussed in relation to their relationship to higher and further education. There has been a steady growth in the number of visits since August 2011, with the largest numbers of monthly visits occurring in April 2012. 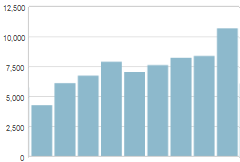 In April 2012 there were 10,683 visits, an average of daily 356 daily visits. In February 2012 the UK Web Focus blog was ranked in 34th place of Technology blogs and in 1,026th place of All blogs according to the eBuzzing service. As illustrated in the accompanying graph (which shows the trends for the Technology category) this is the highest ranking in the Overall category since February 2011 and the highest every Technology ranking. On 6th February 2012 the blog was ranked at 541 in Technorati’s Technology category (of 34,642 blogs), 3,503 in the Info Tech category (of 34,748 blogs) and 2,711 in the Overall category (of 1,293,010 blogs). This is equivalent to being listed in the top 1.56%, 10.1% and 0.21% of all blogs in the respective categories. 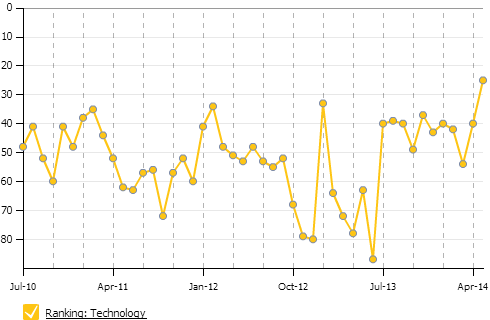 Note, however, that Technorati rankings do seem to be volatile. A geographical summary of blog usage collected by the Clustermaps service for 2011 and the first two weeks of 2012 is available. 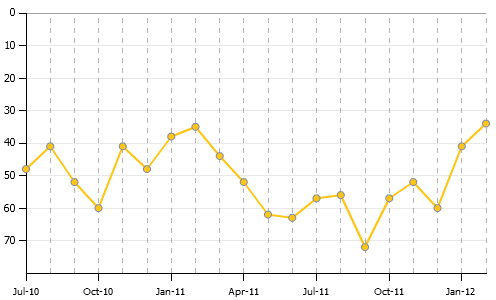 An annual WordPress summary of blog usage for 2011 has been published. These was based on the 157 posts published during the year. Your blog is an inspiration, long may it continue! Well done by the way – I catch your bog in my rss reader and am flabberghasted that you can post so much (and all good) – I’m cheering for you. I love your blog. You have a knack of finding the right subject and the right lessons from it. delighted to nominate because it’s a well deserved nomination. Your blog is an excellent way to keep myself informed about Web 2.0 and it’s good to have a HE perspective. I have to say that I do admire the amount of time and effort that you put in to the blog and it puts us lesser blogging mortals to shame! In February 2011 the UK Web Focus blog was ranked in 35th place of Technology blogs and in 834th place in All blogs according to the Wikio service (subsequently renamed EBuzzing). 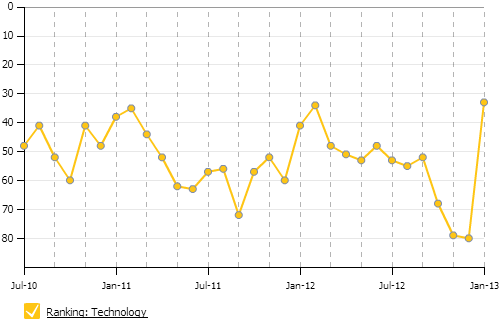 This is the highest ranking in the Overall category since October 2009 and the highest every Technology ranking. On 25th February 2011 the blog was ranked at 515 in Technorati’s Technology category (of 25,789 blogs), 1,176 in the Info Tech category (of 25,789 blogs) and 4,495 in the Overall category (of 1,256,805 blogs). This is equivalent to being listed in the top 2%, 4.6% and 0.04% of all blogs in the respective categories. Note, however, that Technorati rankings do seem to be very volatile. A survey was carried out in the 2 week period starting on 1st November 2010. The results are available. In addition a blog post giving a summary of the findings has been published. 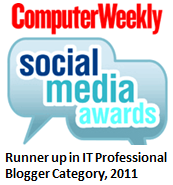 The blog was shortlisted for the Computer Weekly’s IT Blog awards 2010 in the Individual IT Professional Male category. 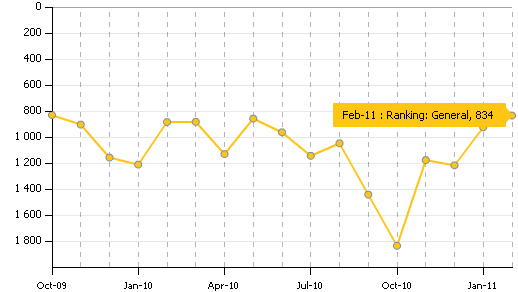 A summary of blog usage in 2010 was provided by WordPress.com. On 15th September 2009 the UK Web Focus blog was in 26th place in WordPress.com’s list of Growing Blogs. On 12th May 2009 the UK Web Focus blog was in 13th place in WordPress.com’s list of Growing Blogs. On 13th January 2009 the UK Web Focus blog was in 56th place in WordPress.com’s list of Growing Blogs. Rather than carrying out a formal survey, details of comments about the blog and other examples which may illustrate the readers’ views of the blog are provided below. The blog was nominated for the Best educational tech support blog category of the Edublogs 2008 awards. Martin Weller nominated the blog, stating that “rather obviously I’m opting for Brian Kelly’s blog. Brian manages to push at the comfort boundaries of IT services, but does so with intelligence and insight into the practical issues“. AJ Cann also nominated my blog. James Clay was torn, nominating Steve Wheeler’s Learning with ‘e’ blog for the Best individual blog, although he went on to add that “Other blogs that were in the running include Josie Fraser’s SocialTech blog and Brian Kelly’s UK Web Focus. The key here was which blog did I read on a regular basis and which inspired me the most“. James went on to state that in choosing his selection for the Best educational tech support blog he “was torn between Andy Powell and Pete Johnston’s eFoundations blog and Brian Kelly’s UK Web Focus” before choosing eFoundations for this category. The blog was shortlisted in the Web 2.0 and Business category of the Computer Weekly IT Blog Awards 08 competition. The shortlisting was featured in a news item on the JIC Web site. An initial formal survey was carried out in the 4-week period starting on 28th August 2007. The results are available. In addition a blog post giving a summary of the findings was published in October 2007. The blog was listed in first position is a list of Fastest Growing Blogs on 15 December 2006. The following table summarises the number of posts published since the launch of the blog in November 2006. Brian, perhaps worth uploading this to http://www.edocr.com?